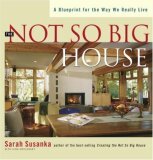 Last night, I listened to a lecture titled "Not So Big Steps Toward a More Sustainable Community" given by Sarah Susanka, author of "The Not So Big House" and other related books. It was put on by the Center on Sustainable Communities, a new group in Des Moines that is doing some great things. I have read several of her books in the past, and I was so excited to see that she was going to be speaking. *Reproportioning...we shouldn't be so focused on square footage. You just need to find the right size for YOU/YOUR FAMILY. It's usually about 1/3 less than you "think" you need. The feeling of home has nothing to do with square footage...it should be quality, not quanitity. *Building bigger and bigger homes is just kind of "expected" in our society. When you make more money, you should buy a bigger house. Status comes with the size of your house. What we really need to start doing is building smarter. Take the money you would have spent making it bigger than you need, and put it into green/sustainable design and give your house beautiful, unique features. *We have no language/words in the real estate business for "small = better". We only talk about cathedral ceiling, spacious, 3 car garage, etc. We need to re-create the language so there isn't such a negative stigma to being smaller. We also don't have a model for knowing when enough is enough. *It's important to create/decorate your home so you are inspired everyday. If you don't want to paint your walls, for fear of lowering the re-sale value...that's silly! PAINT THE WALLS! Whatever color will make you the happiest! Don't keep looking to the next place you'll live...live fully in the space you are in NOW. *"Kids understand implicitly the pleasures of a cozy nook. Adults can learn something from our children as we go about designing our homes." I loved this topic, because I could totally relate. When you were a child, did you have a special place you went to where you felt safe and cozy? I did...I had a little cubby under the stairs where I would hold "secret" meetings and set up my toys. I was so happy in that space. I'm still like that today...I love a nice, cozy nook to "hide" away from the world in. *New Urbanism...building for community and liveability. *Have spacial awareness...don't forget the 3rd dimension. She talked a lot about adding different ceiling heights, and other architectural details. But I feel like you can do this in an apt. as well...by using hanging lamps, mobiles, etc. to create that 3rd dimension. *Paul Ray and the Cultural Creatives...an interesting concept. I really connect with all of their ideals...I'll have to research this one more. All in all, it was a great night. Even though much of the audience was made up of builders, architects, people who own homes or are building (and I am none of the above)...I really enjoyed it. She has a great sense of creating "home" and the importance of creating a home that you love and can't wait to come back to every day.